Finally my monthly visitor is gone. I was so stress that I thought I was pregnant. I have never been delayed once and it freaked me out knowing that my husband has an accident with his condom. we are both old and having another baby is not in our future plans. Our kids are 12 and almost 8 years old. I can go back to work out. I missed doing it. I missed my hula hoop so much. I will also start to do the Zumba. Nothing beat the feeling when you perspire. It feels real good and make you proud of yourself when you do something real nice. Work out here I come. I still want to lose some fats in my tummy. I want to wear my swimsuit this summer with proud knowing that I work hard to make it happen. 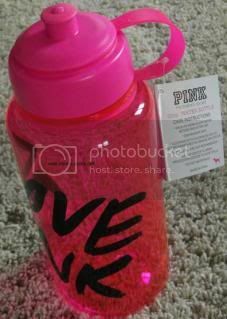 I just bought this water bottle from Victoria’s Secret. I pick the color pink as I love pink. Most women love pink, right? I am one of them. This is from the line PINK. I bought it for $12.50. I think the price is worth to buy. It is very durable too. I pour water everyday with ice to keep the water cool after the work out or playing the hula hoop. The water bottle can fill up 32 0Z of water. You can pour four glasses of water. It is very easy to use. You can pull the top when you want to drink and push it down to prevent leakage. My kids love it too especially my little girl. She thinks I bought the water bottle for her. This is also perfect to carry during the summer. I love to drink water a lot. I try to avoid drinking pop to help me shred my big stomach. This water bottles come with free item too. It is one why I bought this water bottle. What about you? Do you like to drink water too? Do you your own water bottle? I am linking this entry to the 24th day of blog photo challenge. 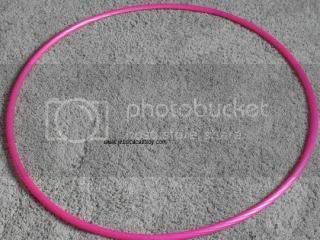 I use this hula hoop if I do not work out. There are times in the morning that I am so hungry that I do not have the urge to work out. I do not want to miss my work out or else I get lazy. I love this pink hula hoop of hers. It is very easy to work out with your waist. I hope it will help me get rid of the big bulge on my stomach. I use the hula hoop sometime in the afternoon. I love to work out in the morning before Christmas. Most of the time, I feel hungry and cannot help but have my breakfast. This pink hula hoop is my rescue. It is easy to use. I even have a competition with my little girl. She always win no matter how hard I try to swing my wait.